We're on the day that they went to the market to buy raclette cheese. Now, they gotta make dinner with that cheese! 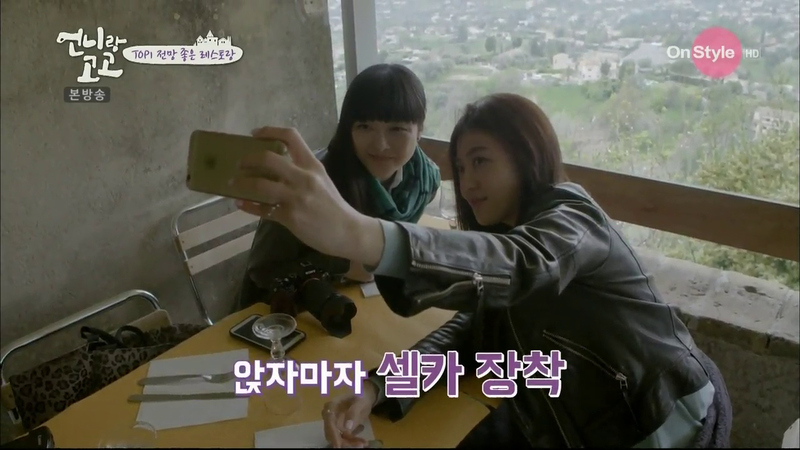 In her interview, Jiwon still can't pronounce raclette. After looking everywhere for it, she finally finds it! She then has to cut the cheese and picks a CLEAVER to cut her cheese hahaha. Her unnie is meanwhile getting interviewed about her expectations for Jiwon's cooking today. She mentions the pancake. Jiwon: Please erase my "kimchi jeon" image. Jiwon: I said I wasn't going to cook anymore, but I need to overcome the trauma. The way she cuts that cheese is simultaneously hilarious and terrifying. Who handles a cleaver like that?! "How anxious viewers will be when they watch this." Glad you know, Jiwon. She's like yay, preparation is done. She happily carries her plate of ingredients to the stove. She turns on the stove then realises she forgot to do some stuff. 1. Set the table because food must be eaten hot. 2. Cut bread, which she has way too much difficulty in such that she starts laughing at herself. "I'm going crazy." 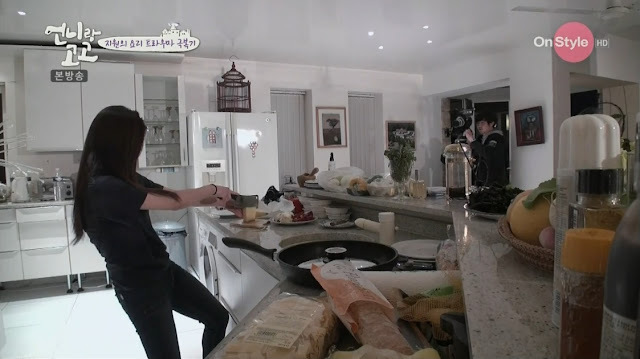 I can't get enough of her ridiculous poses while cutting food hahaha. The narrator is like "But she's the best action actress in Korea. An action actress with no strength." After her battle with the bread, she takes out wine lol. She goes back to the stove and prepares to cook again, but realises she forgot something again. She cuts potatoes and finally starts cooking. 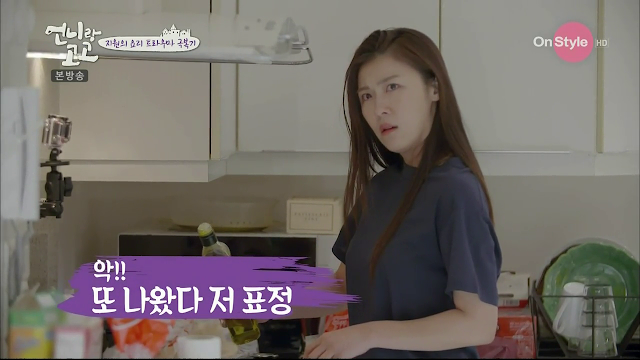 LOL she checks whether the potatoes are cooked after just 20s, then 30s she checks again, and then checks again a few seconds later. She seems quite happy after that cos she starts dancing in the kitchen. And she has reason to be happy cos the food looks good!! But seriously, 2 tomatoes with a few vegetables and a little cheese for dinner?! 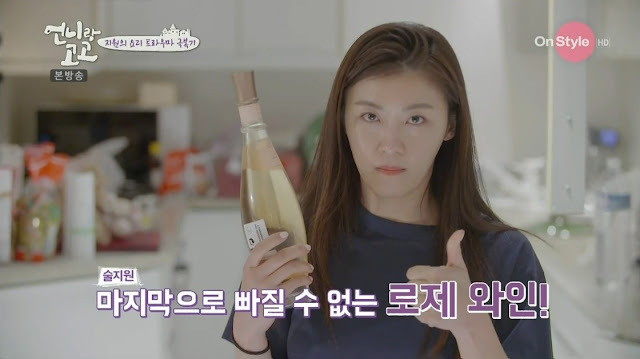 Jiwon tries it and she thinks it's delicious and makes her fainting expression. Jiwon, in anticipation: How is it? And she asks several times for confirmation. "It's nice right?" "It's very nice right?" But then Yookyung flips her tomato and it's charred again hahahaha. Aww, sweet Yookyung asks whether Jiwon's feet are ok first. 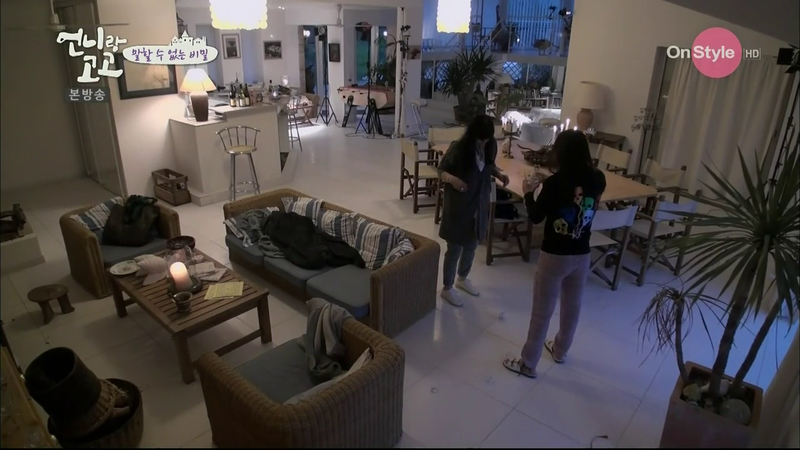 While Jiwon is just like "Eotteokhae....."
They start cleaning up and Jiwon still doesn't understand how she dropped it. They finally go to bed at 1am. The next morning, Jiwon makes coffee and is typing something on her iPad. It's lyrics for her song about that donkey -_- In an interview section later, she read the first line: You're Zoe. I enjoy. At least she knows how ridiculous this is. On one of her visits to the donkey, "It's really smart just like a human. And it has a lot of pride." because the donkey wasn't listening to her. When the donkey followed her, "It seems like I won the push-pull this time." She continues reading her lyrics: I sent you a smile, but you spit on my sister. HAHAHA you can hear the crew laughing. Anyway, back to their activities for the day. She's communicating with the camera. I'm not very sure about this part but I think she's asking if they can turn off the camera for an hour because they need to eat and shower and the camera is like nope. She tries to film themselves eating breakfast and even adds bgm but she didn't press the recording button lol. 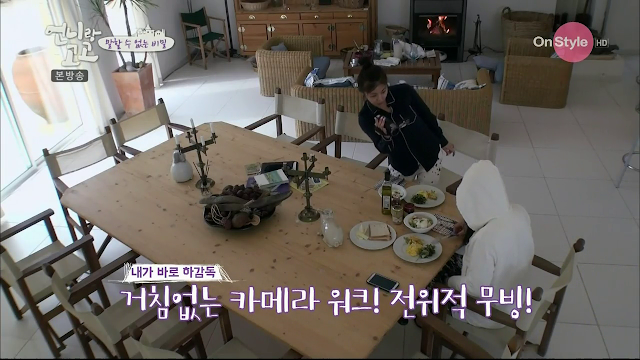 While chatting over breakfast, someone knocks on the door and Jiwon practically jumps out of her seat. Turns out it's Dominique here to deliver presents for Easter. They're finally ready to head out. On the way out, they meet Dominique and John and Jiwon shows John a video she took of that donkey. It's Yookyung's turn to drive today. But Jiwon is a horrible navigator and they keep ending up at the same place. At the roundabout, they were supposed to leave at the 3rd exit but left at the 4th exit and ended up the way they came because of Jiwon's wrong instructions. "Just keep turning then go straight." Yookyung: No...it's not that dangerous driving here. Then Jiwon suddenly screams, but it's just her bag that slipped out of her hands. "My bag fell. It's dangerous." They're reaching the place, and the roundabout fiasco happens again lol. Jiwon: It seems like it's better for unnie to navigate. Finally, with much difficulty, they've arrived at St. Paul de Vence. They enter a shop selling figurines because Jiwon is a 'figurine mania'. If you follow Jiwon's instagram, she often posts pictures of figurines. She said they'll go in for awhile, but end up spending 30min inside. The place also sells perfumes so Jiwon takes a whiff. "It's not my style. I think unnie is amazing. The ones that unnie makes are our style." 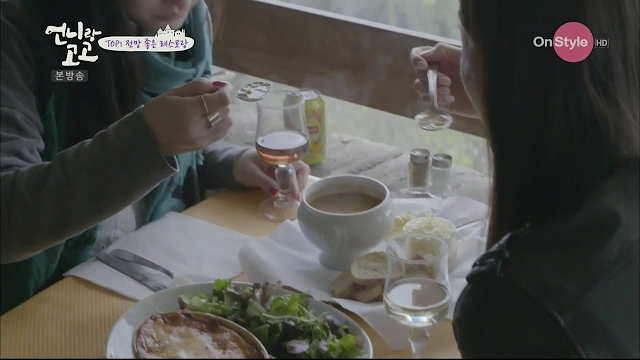 They buy a mortar and pestle that Yookyung wants, and get free gifts! They then enter another shop full of toys. "This is the style I want!" She's like a kid in an adult's body haha. She's playing with something when suddenly, the uncle from the previous shop comes in and turns on one of the chicken toys that starts playing the chicken dance tune and Jiwon shrinks back in horror. "That's what I'm most scared of." And then she picks up a donkey soft toy. LOL her obsession with that donkey is hilarious. She finally decides she'll buy a Pinocchio puppet, which Yookyung offers to buy for her. On the way out, Yookyung turns on that chicken again and the uncle hurriedly turns it off because Jiwon said she was scared. Awww, so sweet. While walking, she says the chicken dance song keeps playing in her head. Next stop is a cookie shop! They each pick cookies to fill a box. The sales people keep making her try the cookies and she's like "Oh no I'm going to gain weight! Wow fans from Taiwan spotted her and are filming her from outside the shop! While paying, the cashier tries to get her to try more stuff. She sighs, then smartly gives it to the crew, then to her unnie. 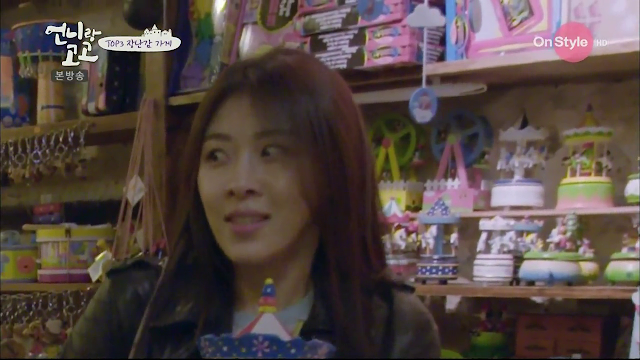 The cashiers must have heard who she was from the fans outside, so they're like "Ha Ji Won?" And she says "Yes!" so excitedly hehe. The last place the visit is a restaurant which was recommended by Dominique. It overlooks the town so they start taking lots of pictures. The food looks amazing omg. Jiwon: This is totally my style. Jiwon: I want to live here!